Oh summertime! The grill is hot; the drinks are cold. But sometimes we need some other options of the same old, same old. The obligatory hot dogs, kabobs, burgers can get tired – so let’s switch it up a bit and grill up some pizza! It’s easy to make savory or even sweet pizzas right on your grill. Start with your favorite pizza dough recipe OR pick up some fresh dough at the store, like Trader Joe’s. Roll out the dough into individual oval-shaped pies, put parchment in between them and store in the fridge until you are ready to fire up. Get your sauces together, like garlicy herb oil or sassy tomato basil. And of course, get all your toppings out: cheeses, roasted veggies, meats, and more. 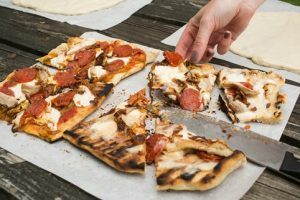 Now get your DIY pizza party going! Preheat the grill! Throw on a dough disk (bring it to room temperature) on and grill on the first side for about a minute, or more. You’ll want to be sure that it’s nice and crispy and has tasty grill marks. Then turn over and top with sauce, cheese and goodies, then cook until done – fun, right? Hosting a Brunch Patio Party? Try grilling up a breakfast pizza: garlicky olive oil, mascarpone, shredded gouda, and crispy smoked bacon. Crack an egg on it and close the lid till just done. For a sweet tooth, dish up and serve a s’mores pie. Cook up the pie crust until it is just bubbling, Turn it over, then top with marshmallows, crushed up salted chocolate bars, and crumbled graham crackers. For added decadence, drizzle with chocolate and caramel sauce – yum! From big bowls of creamy ice cream and refreshing fruity sorbets to gelatos and all-American ice cream sandwiches, frozen treats have long been a favorite for kids of all ages. And making homemade ice cream couldn’t be easier these days. Ice cream makers are super affordable and it’s a fun activity for everyone. The best part? You can literally go wild with custom flavors. Love a ginger and pineapple flavor combo – then go for it! Want a dairy-free alternative? Try making it with coconut or almond milks! 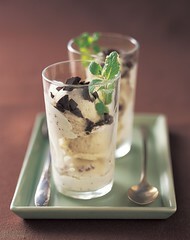 With my basic recipe for a Sour Cream Ice Cream Base, you can add in any of your backyard bounty from fruits to herbs. Get creative! If the mint in your yard is taking over the garden like mine is, then whip up a batch of Homemade Chocolate Chip Mint Ice Cream with easy to make lush chocolate inclusions to fold in – yum! So pretty and tasty served in little frozen glasses topped with a fresh mint sprig! But maybe making ice cream is just too much. Well never fear! Head to the freezer isle of your local grocery store and try out some of these speed scratch ideas. –Chocolate Pretzel Swirl – chocolate ice cream, crushed pretzels, chopped chocolate bars and toasted walnuts. This recipe is a great base to incorporate in any fresh summer fruit. Place fruit, spices, sugar and half & half in a blender. Process until fruit is broken down but some chunks still remain. Place fruit mixture in a large bowl. Whisk in cream and sour cream until smooth. Chill mixture for at least 30 minutes. Place cream mixture in ice cream maker and freeze according to manufacturer’s directions. When mixture is frozen, fold in the walnuts if using.